Mobilegeddon - Will Google's New Algorithm Affect Your Website? If you’ve waited until now to make your website mobile-friendly, you can no longer keep waiting. On April 21st, Google updated its search ranking algorithm which has affectionately become known as "Mobilegeddon". Google has performed updates in the past, including Panda and Penguin. Yet Google’s Zineb Ait Bahajji stated that this change to the algorithm will have an even bigger impact than the two prior. >> Is Google's new algorithm making you freak out? Get a free "Mobilegeddon" assessment now! With over half the population accessing websites through mobile devices, it made sense for Google to reward those sites that had already taken the steps to offer users an easy and convenient experience on their phone or tablet. This month, Pew Research issued a report on smartphone use that makes you realize the old days of “going online” via a desktop are rapidly receding in the rearview mirror. So now you that you know all this, what should you do? First, you should check your search ranking. If your website is not optimized for mobile, then undoubtedly you will discover a significant drop. Next check out the nifty mobile-friendly test tool Google created. It analyzes a URL and generates a report for you. Just go here to try it. 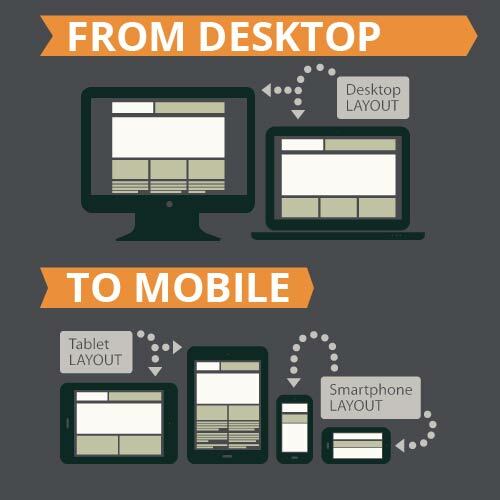 Finally, you have to choose between a responsive or dynamic design solution. We suggest what Google recommends as the most optimal choice available: responsive design. The reason why responsive design is best is because it doesn’t create two copies of the same site. Visitors to your site only have one URL to go to, which responds and adapts according to the device – thus the term: responsive. Dynamic design is different and prone to errors. It uses what is known as “user-agents” to detect what type of device is being deployed and then adapts accordingly. It requires changes in the code structure (HTML) of the site, thus making it susceptible to errors. >> Is your website mobile friendly? Get a free "Mobilegeddon" assessment now! We recommend that you avoid any dynamic-based solution and stick with a responsive design. It simply offers users a better and more consistent experience and eliminates the need for two copies of the same URL. It also helps the Googlebot to better crawl your site and raise your search ranking due to the efficiency of a single site. It’s also a lot easier on folks like us because when we make changes we only have to go to one place. Responsive design is best for everyone! If you’ve been waiting to make your website responsive, wait no more. Your prospects and customers expect a seamless experience on mobile devices and your competitors are certainly going to deliver that for them. We can help you keep up with this change and even get ahead of the game! Call us today at (951) 479-5411 to learn more about the benefits of responsive design and a mobile-friendly website and to get a free website assessment.